The tutorial explains how you can quickly apply or change table styles and remove table formatting keeping all features of an Excel table. After you have created a table in Excel, what's the first thing you would like to do with it? Make it look exactly the way you want! Luckily, Microsoft Excel provides a variety of predefined table styles that let you apply or change the table formatting in a click. If none of the built-in styles meets your needs, you can quickly create your own table style. In addition, you can show or hide the main table elements, such as header row, banded rows, total row, and so on. This tutorial will show you how to leverage these useful features and where to get started. Excel tables make it a lot easier to view and manage data by providing a handful of special features such as integrated filter and sort options, calculated columns, structured references, total row, etc. By converting data to an Excel table, you also get a head start on the formatting. A newly inserted table comes already formatted with font and background colors, banded rows, borders, and so on. If you don't like the default table format, you can easily change it by selecting any of the inbuilt Table Styles on the Design tab. 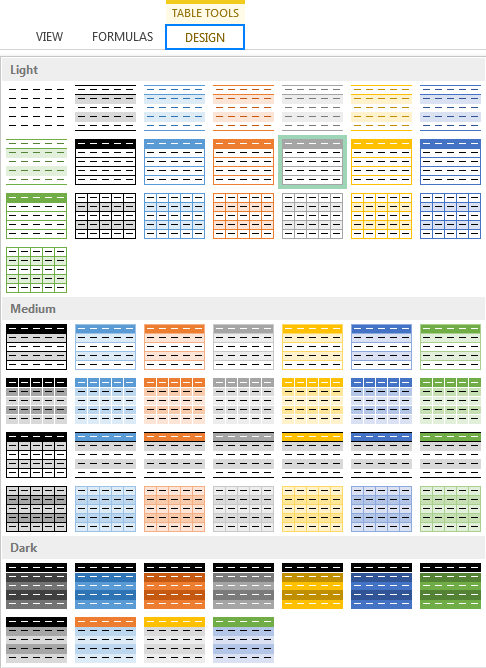 The Design tab is the starting point to work with Excel table styles. It appears under the Table Tools contextual tab, as soon as you click any cell within a table. As you can see on the screenshot above, the Table Styles gallery provides a collection of 50+ inbuilt styles grouped into Light, Medium, and Dark categories. You can think of an Excel table style as a formatting template that automatically applies certain formats to table rows and columns, headers and totals row. Header row - display or hide the table headers. Total row - add the totals row at the end of the table with a list of functions for each total row cell. Banded rows and banded columns - show alternate row or column shading, respectively. First column and last column - apply special formatting for the first and last column of the table. Filter button - display or hide the filter arrows in the header row. Select the range of cells that you want to convert to a table. On the Home tab, in the Styles group, click Format as Table. In the Table Styles gallery, click the style that you want to apply. Done! Click any cell within the table whose style you want to change. 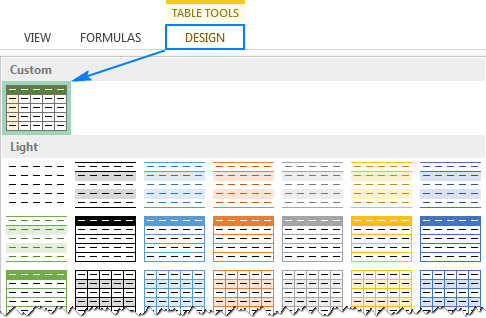 On the Design tab, in the Table Styles group, click the More button to show all available Excel Table styles. 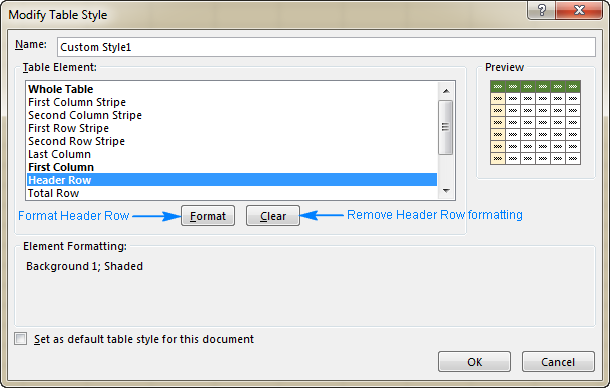 Hover your mouse over the style you want to apply, and Excel will show you a life preview. To apply the new style, just click on it. Tip. If you have applied any formatting to the table manually, e.g. highlighed certain cells in bold or with a different font color, selecting another Excel style will keep the manually applied formats in place. To apply a new style and remove any existing formatting, right-click on the style, and then click Apply and Clear Formatting. And now, whenever you click Table on the Insert tab or press the table shortcut Ctrl+T, a new table will be created with the selected default format. On the Home tab, in the Styles group, click Format as Table. Or, select an existing table to display the Design tab, and click the More button . Underneath the predefined styles, click New Table Style. In the New Table Style window, type a name for your custom table style in the Name box. 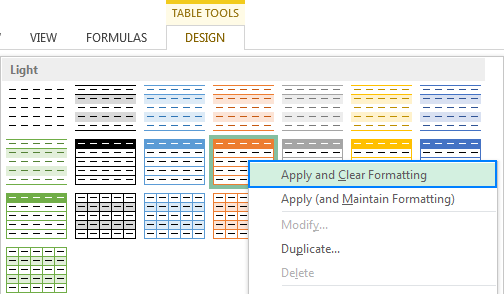 Under Table Elements, select the element you want to format and click the Format button. 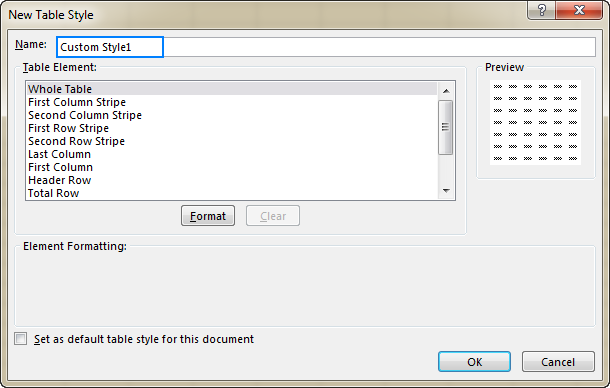 The Format Cells dialog will open, and you select the desired formatting options on the Font, Border, and Fill tabs. To remove existing formatting, click the element, and then click the Clear button. The formatted table elements are highlighted in bold in the Table Element box. The formatting changes are shown in the Preview section on the right. To use the newly created table style as the default style in the current workbook, select the Set as default table quick style for this document box. Click OK to save your custom table style. 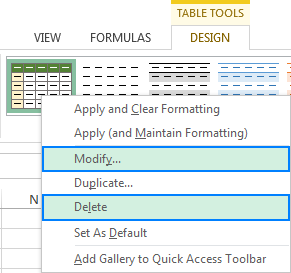 To delete a custom table style, right-click on it, and select Delete. The built-in Excel table styles can neither be modified or deleted. Tip. A custom table style is available only in the workbook where it is created. If you want to use it in another workbook, the fastest way is to copy the table with the custom style to that workbook. You can delete the copied table later and the custom style will remain in the Table Styles gallery. Select a range of cells to which you'd like to apply a table style. On the Home tab, in the Styles group, click Format as Table, and then click the desired table style. Select any cell within a newly created table, go to the Design tab > Tools group, and click Convert to Range. Or, right-click the table, point to Table, and click Convert to Range. Tip. To remove a table but keep data and formatting, go to the Design tab Tools group, and click Convert to Range. Or, right-click anywhere within the table, and select Table > Convert to Range. 31 Responses to "Excel table styles and formatting: how to apply, change and remove"
Sorry, it's impossible to advise anything based on such a generic description. Can you please elaborate on the task a bit more? I have nearly 200 employees log in in log out details with different shift timing. Everyday the employee will come to the work at different shift, how to find out that the employee has come to the duty at correct time or not by using ms excel. We have 3 shifts. Morning to afternoon, afternoon to night and night to morning. For instance, today an employee called A came in the morning shift at 6 am and then tomorrow coming in the afternoon 2 pm and then the following day coming at night 10 pm..I wanna find out, whether he came to the shift to correct time or not and how many hours he worked. Can you give some idea in this regard? Hello, just a thought, can you not give the poor employee a normal shift pattern? That might make it a lot easier for both of you! I have a database and the phone cell is write like this (623)700-4388 but I need get simple form like this 6237004388. Do you know if I can change this the list is big.. and I do not want to do this manually. You can use Excel's Find and Replace command (Replace All), and replace the opening and closing parenthesis as well as the dash with nothing. I've been searching with no luck, if there is a way in which a custom table style o custom pivot table style can become the default style for every other workbook created after that. When the table comes from an external database (ie sql server in my case) , each update of the database turns off all my formattings. Whenever I import data from SQL server blue shaded table style if selected by default. I need some other style. Even if I set it as default, still every time data is imported the blue shaded table comes to effect. *visual perspective but not the cells themselves. Worked a charm! Thank you. In the Excel window, click anywhere inside the PivotTable report. Under Pivot Table Tools, on the Options tab, in the Actions group, click Select, and then click Entire PivotTable. I have two tables on same sheet (side by side) i.e. the rows of both the tables remains same. So when i filter the data of one table, the data on other near by table too changes which i don't expect it to do. Note that i don't want to place the tables one below another & want both tables on same sheet side by side. How types of data validation? i want to know . how can i use index formula in multiple cell? When printing a table, is there a way to double space the rows (without inserting blank rows or increasing the row height)? Thanks. I prepare a list of parked vehicles in the parking slot. On the daily basis how to check if a vehicle is parked continuously for more than one day? After adding a new row in the table, my auto row count function =SUBTOTAL(3,C$3:$C37) stops working properly in the first column. It messes up the new row count and the one previous to it.